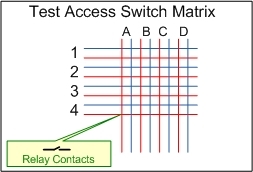 A Test Access Matrix can be used as a method of switching 1 or more circuit pairs to another pair of wires. 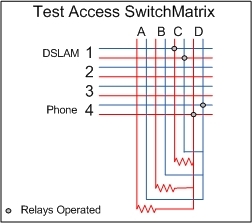 This is the principle of sending line circuits to another place for cross connections or to allow testing. The ability to route a pair of wires (or more) to a test desk, test equipment or different test scenario is very useful in a test laboratory. Automating this using relays or electronic gates can assist in quicker testing and changes to configurations by simply controlling the switches. Lets take a simple four by four cross matrix. There are 4 possible connections that can be made without using the same pair twice. For example 1A, 2B,3C,4D or 1B, 2C, 3D, 4A etc. The relay contacts are normally open and when current is connected they latch and remain in this state until current is applied again. 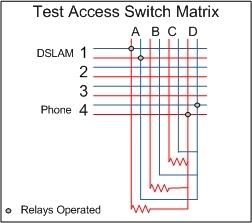 Managing this switching via a controller or PC simplifies changes and allows a very flexible test system to be created. Operating the relays for pairs A1 & D4 gives an end to end circuit with 1 Mile of resistance. The tests can then be performed on the line to see the impact, more importantly they can be rerun quickly i.e regression testing as and when required by simply setting the same configuration of relays.